Rector of Universitas Indonesia (UI) Prof.Dr.Ir.Muhammad Anis, M.Met accepted the visit of Minister of Education and Skills of Ireland, H.E Mr. Richard Bruton; Ambassador of Ireland for Indonesia, H.E. Mrs. Olivia Leslie and the Leader of Higher Educational Institution of Ireland on Tuesday, September 18th 2018 at Rektorat UI Building, Kampus UI Depok. 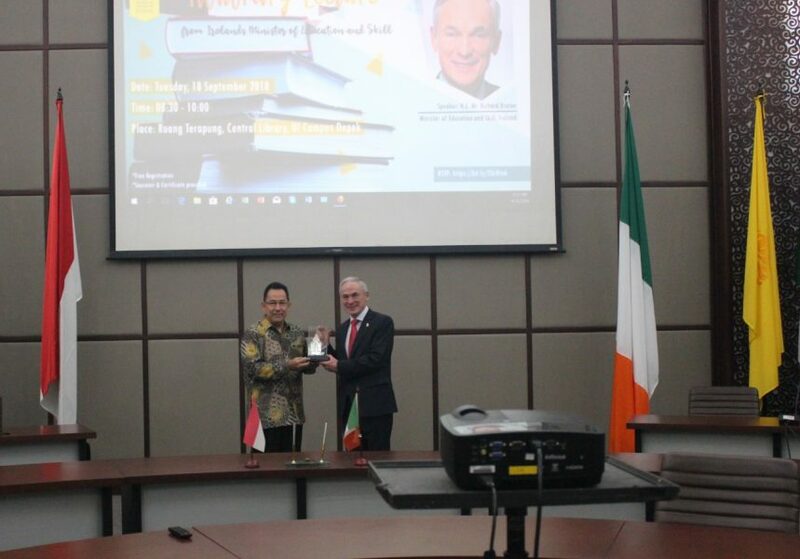 In the event, Bruton delivered Honorary Lecture and signed Memorandum of Understanding between UI and University of Limerick and National University of Ireland, Galway. Rector of UI said that “ UI greet the visit of Mr. Richard to UI with pleasure. We accept it as appreciation for UI and hopefully UI and Higher Education of Ireland would be able to collaborate in order to improve Higher Education quality in UI and Indonesia in general. The visit of Mr. Richard becomes the door opening marker of cooperation between the two countries. So this opportunity is not only for UI, but also for other campus in Indonesia. Among of collaboration that is running between UI and two Universities of Ireland are student and lecture exchange, double/joint degree, and research cooperation as well,”. In his speech, Mr.Robert said that young people such as students are one of potential human resources for a country. Thus, Ireland focus in developing the best education system in order to complement the young people with science, knowledge and also skill. Ireland has seven high-standard Higher Education Institution with various science excellence, start from bio energy, nano technology, maritime up to ICT (information, communication and technology). Opportunity that is able to be developed between Ireland and Indonesia could be research development in agriculture, energy renewal and information and communication technology development. More over, in the signing of Memorandum of Understanding, there are several important points that will be collaborated, such as academic staf, lecturer and student exchange; development of research and new innovation that is beneficial for public; and double degree program. This visit hopefully can be the momentum of Higher Education of the two countries to cooperate in order to improve Higher Education system in Indonesia and opening the other cooperation opportunity that has not been explored yet.